Acute-on-chronic liver failure (ACLF) is a syndrome characterized by profound disrupted coagulation and fibrinolysis. Fibrinolytic marker D-dimer is increased in critically ill patients with cirrhosis which is associated with poorer prognosis. We aim to determine the potential association of D-dimer with the 28-day mortality in ACLF patients. In a single center retrospective study performed in China, we collected data of 115 patients with ACLF from October 1, 2012 to December 31, 2016. We investigated correlations between D-dimer and other laboratory tests and prognostic scores. The relationship between D-dimer and 28-day mortality was explored by smoothing plot with an adjustment for potential confounders. Logistic regression analyses with crude and adjusted models were performed to explore the association of D-dimer with 28-day mortality in ACLF patients. In ACLF patients, D-dimer at admission was correlated with all prognostic scores (MELD-Na: r = 0.385, P < 0.001; CLIF-C ADs: r = 0.443, P < 0.001; CLIF-C ACLFs: r = 0.375, P < 0.001). A nonlinear relation between D-dimer and 28-day mortality was found with a turning point at 6.5 mg/L FEU. D-dimer level was independently associated with 28-day mortality with an adjusted odds ratio of [1.4 (1.0–1.9), P = 0.030] as continuous variable and [10.3 (1.3, 81.5), P = 0.028] as a classified variable with the cut-off of 6.5 mg/L FEU. An elevated D-dimer within the following 10 days also tended to be associated with higher risk of 28-day mortality [OR: 27.5 (0.9, 814.9), P = 0.055]. Elevated D-dimer levels was associated with increased risk of 28-day mortality in patients with ACLF in China. Acute-on-chronic liver failure (ACLF) is a syndrome characterized by acute decompensation of chronic liver disease associated with organ failures and high short-term mortality [1–3]. Coagulation failure reflected by elevated international normalized ratio of the prothrombin time (INR) levels was one of the most common signs of disease in ACLF patients [1, 4]. However, INR is based on the levels of procoagulant factors and not anticoagulant factors. It is regarded as an accurate marker of liver function, rather than a predictor of bleeding or thrombosis , which do not adequately reflect the hemostatic status in patients with liver disease. Recent studies have highlighted the disturbances of coagulation and hemostasis (involving coagulation, platelets, and fibrinolysis) in patients with acute and chronic liver diseases . Hyperfibrinolysis resulting from clotting activation has been reported in patients with cirrhosis and fulminant liver failure since 1990s . Prognostic values of various biomarkers in clotting and fibrinolytic system has also been proposed [8, 9]. 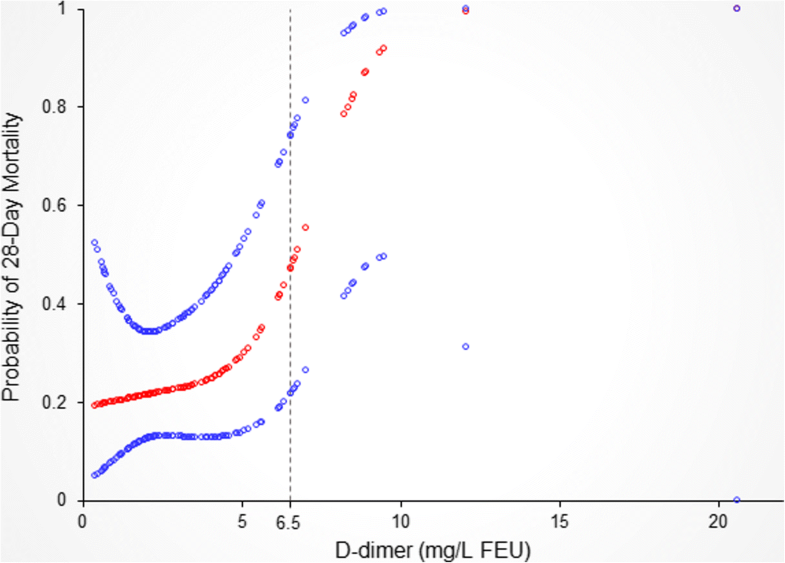 D-dimer is a soluble fibrin degradation product that released from crosslinked fibrin by the action of plasmin , which is increased in critically ill patients with cirrhosis [7, 11–13]. However, the association between D-dimer and short-term prognosis in ACLF has not been elucidated yet. The aim of this current study was to evaluate the independent effect of D-dimer on short-term prognosis of ACLF patients. In this single-center retrospective study, consecutive hospitalized patients admitted to the hepatology units of Nanfang hospital from October 1, 2012 to December 31, 2016 with diagnoses of liver failure at discharge or death were screened (Fig. 1). The exclusion criteria included: (1) younger than 12 or older than 80; (2) not meeting ACLF diagnostic criteria of the Asia-Pacific Association for the Study of Liver (APASL) ACLF Research Consortium [2, 3]; (3) hepatocellular carcinoma or other types of malignancies; (4) complicated with other severe chronic extrahepatic diseases; (5) complicated with portal venous thrombosis (PVT) or deep vein thrombus (DVT); (6) under immunosuppressive therapy; (7) history of liver or kidney transplantation; (8) uncertain 28-day outcome; (9) absence of D-dimer test at admission. The study protocol was approved by the Ethics Committee of Nanfang Hospital, Southern Medical University, Guangzhou, China (NFEC-201706-K4). Demographic data, prior history, clinical, physical examinations, laboratory tests and radiological examinations were obtained from electronic medical records. D-dimer was measured by the Sysmex CA7000 analyzers using the INNOVANCE D-dimer assay (Siemens Healthcare Diagnostics Products GmbH, Marburg, Germany). Liver cirrhosis was diagnosed by radiological evidence of liver nodularity or endoscopic signs of portal hypertension at or before admission. Survival rates were obtained through patient medical records or by direct contact with patients or their kins. The model for end-stage liver disease (MELD) , MELD sodium (MELD-Na)  scores, CLIF Consortium ACLF score (CLIF-C ACLFs)  and CLIF Consortium Acute Decompensation score (CLIF-C ADs)  were calculated. Organ failures were determined according to the CLIF Consortium Organ Failure score (CLIF-C OFs) . Diagnosis of European Association for the Study of liver (EASL)-ACLF were according to CANONIC Study . Continuous variables were expressed as mean ± standard deviation (SD) if normally distributed, or median values with interquartile ranges (IQR) if not, and compared by the Student’s t-test, Mann-Whitney U test or one-way ANOVA with Kruskal-Wallis test. Nominal variables were expressed as number (percentage) and compared using Chi-square test and Fisher’s exact test when appropriate. The relationship between D-dimer and 28-day mortality was explored by smoothing plot with an adjustment for potential confounders. A two-piecewise linear regression model was applied to examine the threshold effect of the D-dimer on 28-day mortality according to the smoothing plot. We calculated odds ratios (ORs) of D-dimer for risk of 28-day mortality by logistic regression analysis. Both non-adjusted and multivariate-adjusted models [Adjust I model adjust for: age; international normalized ratio; leukocyte counts; serum bilirubin and serum creatinine. Adjust II model adjust for: age, red blood cells, hematocrit, albumin, neutrophil percentage, serum total bilirubin, international normalized ratio, C-reactive protein, hepatic encephalopathy, and ascites] were applied. Odd ratios were provided with 95% confidence intervals. The discrimination of D-dimer was determined by the area under curve (AUC) of receiver operating characteristic (ROC) curve and validated using the bootstrap resampling method with 2000 replications. The Hanley and McNeil method was used to test the significance of the differences between the AUCs of D-dimer and conventional prognostic scores. All analyses were performed with the statistical software packages R (http://www.R-project.org, The R Foundation, Vienna, Austria) and EmpowerStats (http://www.empowerstats.com, X&Y Solutions, Boston, MA, USA). A two-sided significance level of < 0.05 was used to evaluate statistical significance. A total of 369 consecutive patients were screened, of whom 192 met APASL ACLF at admission. Seventy seven cases were further excluded, 12 for loss of follow-up before 28 days and 65 were due to lack of D-dimer test results at admission. Finally, 115 patients were enrolled in the current study (Fig. 1). Baseline characteristics and clinical outcomes were shown in Table 1. Overall, 94.5% of the subjects had Hepatitis B virus (HBV) related chronic liver disease, 54.8% were diagnosed with cirrhosis, 94.8% were combined with clinical ascites, and 27.0% suffered hepatic encephalopathy. D-dimer at admission was 3.8 ± 2.9 mg/L FEU. Of note, 51.3% of the subjects also met EASL-CLIF ACLF criteria, Liver failure was the most frequent organ failure (86.1%), followed by coagulation failure (37.4%) according to CLIF-OF criteria. The 28-day and 90-day mortality rate were 35.7 and 47.0%, respectively (Table 1). Particularly, we also compared baseline characteristics and short-term prognosis between 115 patient enrolled and 65 cases who were excluded due to lack of D-dimer measurement at admission. As showed in Additional file 1 (Table S1), all baseline variables were comparable between these two groups of subjects, except for higher percentages of hepatic encephalopathy (27.0% vs. 10.8%, P = 0.011), brain failure (10.4% vs. 1.5%, P = 0.034), and proportion of patients who met EASL ACLF criteria as well (51.3% vs. 35.4%, P = 0.039) among those with D-dimer test at admission. All prognostic scores, 28-day mortality and 90-day mortality were similar between these two groups. The correlations between baseline D-dimer level and other laboratory data were explored (Table 2). D-dimer was inversely correlated with log transformed alanine aminotransferase levels (r = − 0.284, P = 0.002), but not correlated with total bilirubin (TB) levels (r = − 0.124, P = 0.189). D-dimer level was positively correlated with INR level (r = 0.234, P = 0.012) and inversely correlated with platelet counts (r = − 0.353, P < 0.001). We also recorded significantly positive correlations between D-dimer and serum creatinine (r = 0.277, P = 0.003), and urea nitrogen as well (r = 0.385, P < 0.001). Positive correlations were also detected between D-dimer levels and leukocyte counts (r = 0.292, P = 0.002), percentages of neutrophils (r = 0.250, P = 0.007) and C-reactive protein levels (r = 0.38, P < 0.001). D-dimer levels at admission were further compared among subjects with various degrees of organs injury according to CLIF-OF score system (Fig. 2). D-dimer levels were unanticipated comparable in subjects with different levels of TB [TB < 6 mg/dl, medium (interquartile range), 5.9 (5.6, 6.3), 6-12 mg/dl: 3.3 (1.7, 8.4), ≥12 mg/dl: 3.0 (1.8, 5.0), P = 0.255] (Fig. 2a). D-dimer was higher in subjects with kidney failure [creatinine < 1.5 mg/dl: 3.0 (1.8, 4.7), ≥1.5 mg/dl: 5.8 (4.6, 7.0), P = 0.007] (Fig. 2b). D-dimer also marginally increased in subjects with severer coagulation and brain injuries [INR < 2: 2.3 (1.3, 3.9), 2–2.5: 3.5 (2.0, 5.5), ≥2.5: 3.1 (2.0, 6.0), P = 0.061; no hepatic encephalopathy: 3.0 (1.8, 4.5), 1–2 grade encephalopathy: 3.9 (1.5, 6.0); 3–4 grade encephalopathy: 5.5 (2.7, 7.7), P = 0.079] (Fig. 2c-d). In addition, D-dimer level varies significantly among EASL-ACLF subjects with different ACLF grades [grade 1: 1.8 (1.3, 4.2), grade 2: 2.9 (1.8, 5.3), grade 3:6.2 (4.2, 8.4), P = 0.022] (Fig. 2e). Among subjects who didn’t met EASL-ACLF criteria at admission, D-dimer was higher in those who developed EASL-ACLF within 28 days than those without EASL ACLF development [4.2 (2.6, 6.1) vs. 2.4 (1.2, 3.5), P = 0.006] (Fig. 2f). 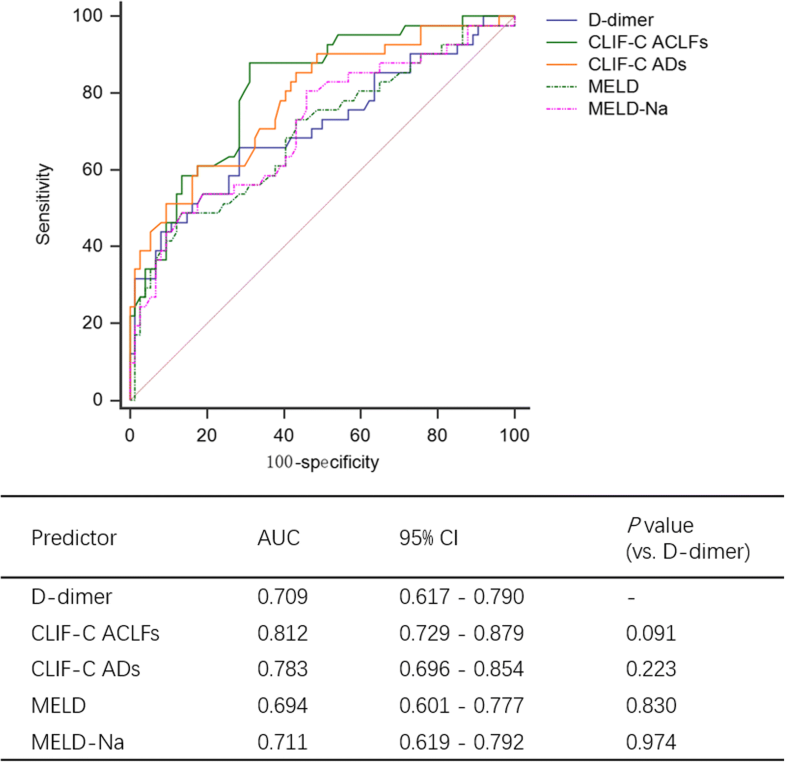 Furthermore, D-dimer levels positively correlated with all prognostic predictive scores (MELD: r = 0.297, P = 0.001; MELD-Na: r = 0.385, P < 0.001; CLIF-OF: r = 0.31, P < 0.001; CLIF-C ADs: r = 0.443, P < 0.001; CLIF-C ACLFs: r = 0.375, P < 0.001, Table 2). The predictive value of D-dimer and other prognostic scores were examined by ROC curve analysis and comparisons. The AUC for D-dimer alone was 0.709 (0.617–0.790) [0.711 (0.605–0.825) in bootstrap validation], which was comparable with CLIF-C ACLF score [0.812 (0.729–0.879), P = 0.091], CLIF-C AD score [0.783 (0.696–0.854), P = 0.223], MELD score [0.694 (0.601–0.777), P = 0.830] and MELD-Na score [0.711 (0.619–0.792), P = 0.974] (Fig. 3). Next, we explored the correlation between D-dimer levels and 28-day prognosis. A nonlinear relationship between D-dimer levels and 28-day mortality with adjustment of possible confounders was detected (Fig. 4). With a D-dimer level < 6.5 mg/L FEU, the estimated dose-response curve was consistent with a horizontal line (β = 1.0, 95% CI = 0.6 to 1.6, P = 0.976). However, the 28-day mortality increased with increasing D-dimer when exceeded the turning point (D-dimer> 6.5 mg/L FEU), with the correlation coefficient (β) of 5.7 (1.3, 24.3) (P = 0.020) (Fig. 4, Table 3). Baseline characteristics between subjects with different D-dimer levels were shown in Additional file 1 (Table S2). The association between D-dimer and 28-day outcome was further explored by logistic regression analysis (Table 4). 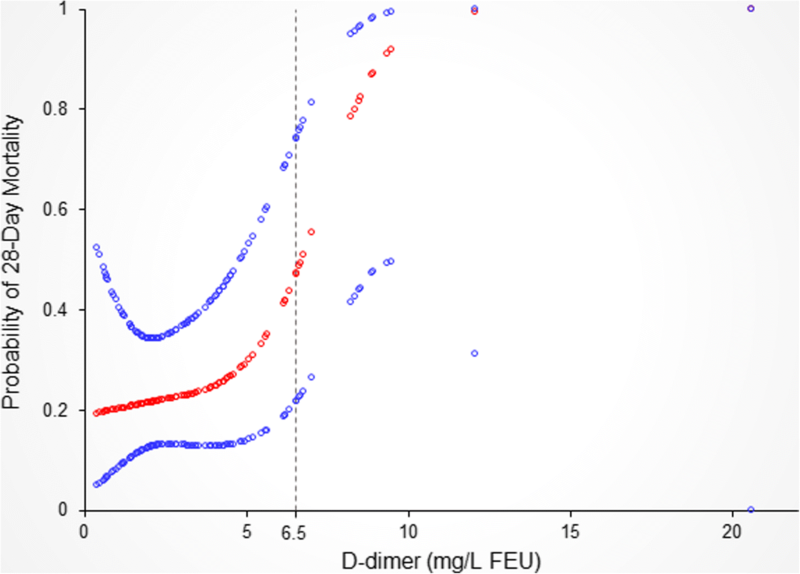 As a continuous variable, baseline D-dimer level was associated with increased 28-day morality in both non-adjusted model [β: 1.4 (1.2, 1.7), P < 0.001] and adjusted models [β: 1.4, (1.0, 1.9), P = 0.03]. When included as a binary variable, a D-dimer level ≥ 6.5 mg/L FEU was associated with significant increased risk of 28-day mortality compared to those with D-dimer level < 6.5 mg/L FEU [adjusted odds ratio: 10.3 (1.3–81.5), Table 4]. We additionally evaluated the correlation between the dynamics of D-dimer level and 28-day mortality. Among 51 subjects with repeated D-dimer test at day 4 to 10 after admission, those with increased D-dimer levels tend to have higher risk of 28-day morality [adjusted odds ratio: 27.5 (0.9–814.9)] compared with subjects with stable or decreased D-dimer levels (Table 4). The association between D-dimer levels and 28-day morality across subgroups according to underlying cirrhosis, ACLF diagnosed according to EASL criteria, coagulation failure (defined as INR ≥ 2.5), hepatic encephalopathy and leukocyte count levels (< 4 × 109/L or > 12 × 109/L) were studied. As shown in Table 5, we detected no significant subgroup interactions. In the present study we investigated the fibrinolytic biomarker D-dimer in patients with ACLF. The most important finding was that D-dimer levels correlated with 28-day mortality in ACLF patients in both non-adjusted and adjusted models. Interestingly, when adjusting for the possible confounders related to D-dimer levels and short-term mortality, a non-linear relationship was observed between D-dimer and 28-day mortality. Threshold effect was then found at the turning point when D-dimer level reached 6.5 mg/L FEU, indicating that the risk for 28-day mortality increased in ACLF patients when they had a D-dimer level higher than 6.5 mg/L FEU. 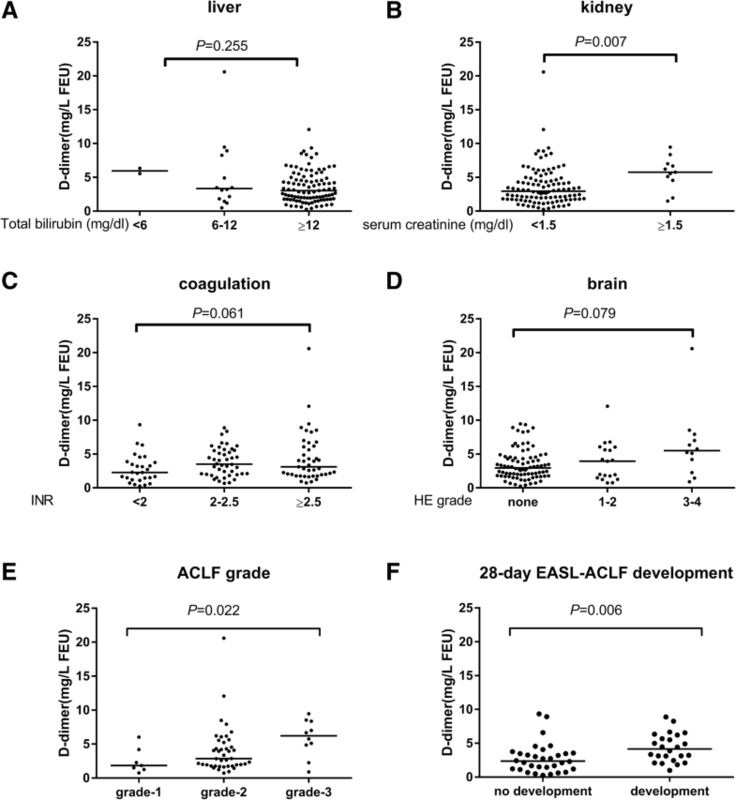 These results emphasize the importance of coagulation and fibrinolysis in the progression of ACLF. The origin of elevated D-dimer in ACLF is not clear. Venous thromboembolism including portal vein thrombosis are increasingly identified in patients with cirrhosis [18, 19]. However, there is no evidence that the development of PVT is responsible for further progression of liver disease . Moreover, with 94.8% of previous compensated chronic HBV related liver disease patients with ACLF, the incidence of PVT or DVT in the current cohort was very low. We only excluded one patients for PVT at enrollment. Therefore, the elevated D-dimer in ACLF patients are less likely derived from venous thromboembolism. Infection and sepsis is highly prevalent in ACLF patients and correlated with poorer prognosis in ACLF [20, 21]. Activation of coagulation in concert with inflammatory activation can result in microvascular thrombosis, which contributes to multiple organ failure in patients with severe sepsis . Indeed, when stratified according to leukocytes counts, the odds ratios of D-dimer in patients with leukocyte cells count < 4 × 109/L or > 12 × 109/L seem to be higher [2.1 (0.9–4.5)] than those with normal leukocyte count [1.2 (0.9, 1.8)], although the interaction effect was not significant (P = 0.1556) which might attribute to limited sample size. Moreover, the correlations between D-dimer and multi-organ injuries supported systematic inflammation. In this circumstances, D-dimer is not only a marker of activation of fibrinolysis, but may also indicating profound systematic inflammation. Hepatic hyper-coagulation and fibrin deposition were also elucidated in explanted liver tissue and mice models of acute liver failure [23–25]. Progressive occlusion of portal microvasculature by microthrombi has been proposed in advanced cirrhosis [26, 27], non-cirrhotic intrahepatic portal hypertension  and hepatic necrosis in liver failure . Therefore intrahepatic hyper-coagulation which leads to secondary fibrinolysis might attribute to the elevated plasma D-dimer in ACLF. However, most previous clinical research aforementioned were based on cohort mainly composed of alcoholic liver disease, while the coagulation and fibrinolysis status of HBV related liver disease which constituted the majority of current cohort was seldom reported. Further studies were needed to provide evidence about the association of D-dimer, systematic inflammation, and intrahepatic hyper-coagulation. Ascites fluid is another possible origin for hyper-fibrinolysis in advanced liver disease . 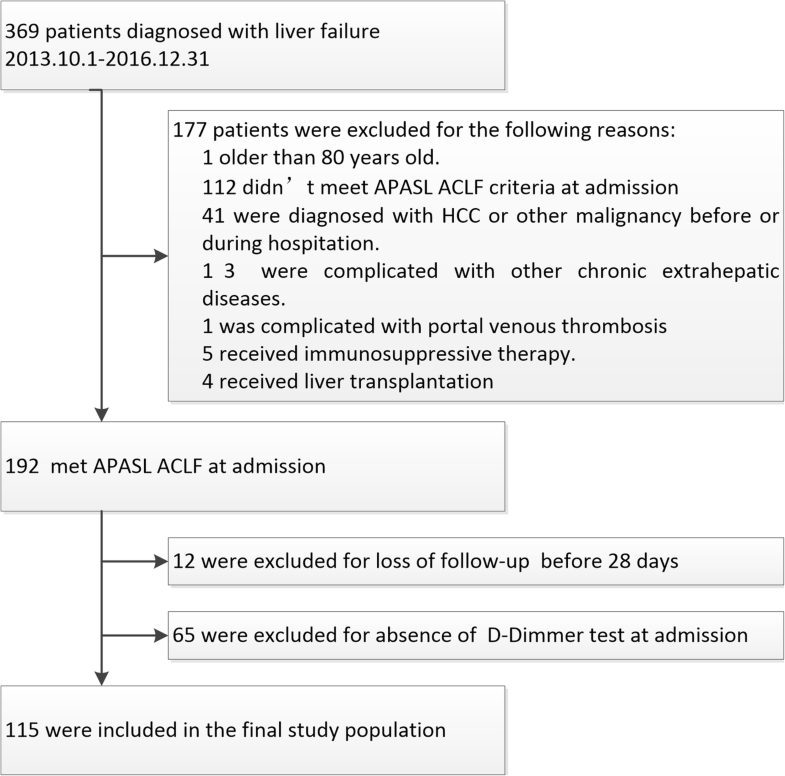 There were 94.8% patients in current cohort had ascites, all of which were the first episode of ascites within four weeks according to APASL ACLF definition [2, 3]. We had adjusted ascites as a confounder in full adjusted models. Therefore, despite ascites might partly explains the elevated plasma D-dimer level, the prognostic value of D-dimer is independent of the presence of ascites. Whether the fibrinolytic activity in ascites varies among patients with distinct prognosis remains to be elucidated. ACLF is an extraordinarily dynamic syndrome . Here we analyzed 51 subjects with repeated D-dimer test within the first 10 days after admission. Patients with a stable or elevated D-dimer tend to have a higher mortality rate [OR: 27.5 (0.9, 814.9)] in full adjusted model, but with wider confidence interval due to the limited sample size. This result indicating the necessity of monitoring D-dimer level in ACLF patients in clinical practice. The major limitation of this study is that although D-dimer is a fibrinolytic marker that easy to be performed in clinical practice, D-dimer results are not comparable among various assays, even among those using similar formats . Whether D-dimer tested with other methods have the similar predictive value remains to be clear. Secondly, due to the retrospective desire, we can not depict the overall perspective of coagulation and fibrinolysis in ACLF, whether other fibrin degradation products have the same effect remains to be clear. Thirdly, the majority of patients in current cohort was HBV-related, whether D-dimer independently predicts poorer short-term prognosis in ACLF related to other etiologies remained to be determined. Besides, there were 65 cases excluded due to lack of D-dimer measurement at admission which may raise selection bias. However, we demonstrated that all baseline characteristics of these patients were comparable to those enrolled in the study, except lower proportion of hepatic encephalopathy and brain failure. Since we detect no significant subgroup interactions between cases with and without encephalopathy, these lost cases had limited effect on the evaluation of independent effect of D-dimer on short-term prognosis of ACLF. This study demonstrated that fibrin degradation products D-dimer correlated with short-term prognosis in ACLF. Patients with elevated D-dimer levels at admission had an increased risk of 28-day mortality. Monitoring D-dimer level provides help in predicting short-term prognosis in ACLF patients. Dr. Jinjun Chen was supported by National Science and Technology Major Project (2018ZX10723203), National Natural Science Foundation of China (81270533, 81470038), National Key Research and Development Program of China (2017YFC0908100), the Specialized Research Fund for the Doctoral Program of Higher Education of China (20124433120016), National High Technology Research and Development Program (863 program, 2012AA022605), Key Scientific and Technological Program of Guangzhou City (201508020262) and Department of Science and Technology of Guangdong Province (2014B020228003, 2015B020226004). Dr. Tingting Qi was supported by President Foundation of Nanfang Hospital, Southern Medical University (2017C047). The funders had no role in the design of the study, collection, analysis, and interpretation of data, decision to publish, or preparation of the manuscript. The datasets generated and/or analyzed during the current study are not publicly available due to patient confidentiality, but are available from the corresponding author on reasonable request. All authors have contributed to, read and approve the manuscript. TQ contributed to the design of the study, acquisition, analysis, interpretation of the data, and drafting of the manuscript; CZ, GL, JH, QH, YC and FZ participated in the acquisition, analysis, and interpretation of the data. JC contributed to the conception and design of the study, and revising of the manuscript; JH approved the study and this submission. For the reason that all data were retrieved retrospectively from the laboratory test information system without additional laboratory analysis or blood samples, so that informed consent for individual patient was not obtained. The study protocol was approved by the Ethics Committee of Nanfang Hospital, Southern Medical University, Guangzhou, China (NFEC-201706-K4).